Click here to see what's required in your state. Alaska keeps its warning against tobacco sales to minors simple, requiring retailers to post these words where customers can easily see them: "The Sale of Tobacco Products to Persons Under Age 19 is Illegal." Delaware requires bold red and black graphics. "Under 18? Don't Even Try to Buy." And in Oklahoma, the state-required sign comes in orange. "It's The Law. We Do Not Sell Tobacco Products to Persons Under 18 Years of Age." Driver licenses in California are color-coded to identify a minor, so it should be pretty easy for a front line employee to identify a 16-year-old trying to make an illegal purchase of cigarettes. But law enforcement in Yolo County, outside Sacramento, find that frequently the sales associates they cite in enforcement stings have sold to minors who present valid ID's that show they are too young to buy cigarettes. Are You Carding For e-Cigarettes? Eleven states prohibit sales to minors... e-Cigarettes are increasing in popularity. States are adding them to the list of restricted products that should not be sold to minors. Today, 11 states consider e-cigarettes as an age-restricted product. In short order, 11 states could change to 12, 15 or even 50 states. FDA Issues Guidance for Retailers We Card to Update Training based upon new FDA info There is a lot of big compliance news to share with you. Some of it will impact your decisions on training employees. Good job! You've trained your employees to prevent tobacco sales to underage customers. But you're not done yet. In fact, you're at risk if your employees don't have the right tools or job aids, as professional trainers would say. Yes, they need tools. We call them "In-Store Support Materials," and they range from a sign in the window to a 365-day tear-off calendar or age-of purchase calendar. For a limited time - We Card is offering two FREE training courses for two employees when you purchase your We Card materials - we're limiting this opportunity to the first 2,000 customers between now and December 31st. Why? 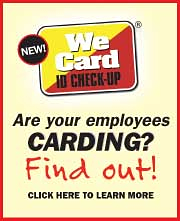 Quite simply, we want you to test drive We Card's training with two of your store employees. Everyone seems to use their mobile phone . . . everywhere and all day long. And more and more, employees are using their phones to be productive at work.